Kernersville is a great place to live. There is so very much to do, see and experience. Our town has been proactive since its inception in the 1800’s. So, it is no surprise that the Kernersville Chamber of Commerce has articles in its past referring to the Chamber in 1892! 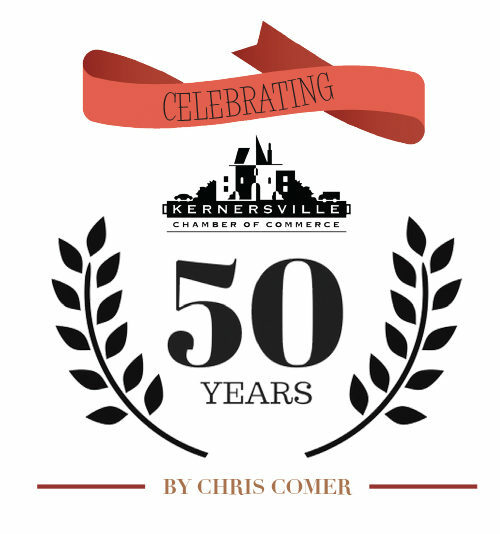 Since 1968, the Kernersville Chamber of Commerce has been serving our community. Fifty consecutive years is a long time. A time of change and opportunity. The Kernersville Chamber has had many leaders. Leaders that gave and continue to give of their time and talents. The Kernersville Chamber has volunteers that span many Committees. A Board of Directors has made up the Chamber since its inception. Many familiar names have led the Chamber Board throughout the years. With so much growth in our community it is no wonder that the number of people that have been involved in the chamber is in the thousands. Why be a member of the Chamber? It is about serving a purpose for the greater good. The beauty of our community is that there are many opportunities to support, get involved, and serve. Members for 50 years in 2018: Carter Publishing Company, Tri-City Real Estate Company, S & R Motor Company Inc., Dillon & Hastings Real Estate Inc, Kernersville Family YMCA, and Wells Fargo all joined in 1968 and continue to be members of the Chamber. There is no doubt the community continues to thrive. From community events such as Spring Folly, Triad Job & Resource Fair, Magnolia’s & Mimosas, Education Grants including Eating for Education & Shopping for Education, the annual Christmas parade, and Recycle Day–your Chamber of Commerce is working diligently to raise awareness of what our community has to offer. Located between the two 40’s, Kernersville is a great place to work, live, and do business. We all know that, so how does your Chamber get the word out? It is with your help, our businesses, and the opportunity to have networking events, seminars and opportunities for guests, visitors, and tourists to experience all Kernersville has to offer. Would you like to get involved? Please like our Facebook page, offer to volunteer for Spring Folly, or the Christmas Parade. Check out our website: kernersvillenc.com. Back in 1892, it was quoted in the Charlotte Observer that “The Kernersville Chamber of Commerce is looking into the establishment of a national bank.” The local news shared that in March of 1892 there was an election of a chairman, officers, and standing committees. As reported by The Union Republican (Winston-Salem), President J.C. Roberts was elected on March 29. In 1902, Dr. B.J. Sapp was the president of the Kernersville Chamber of Commerce and that same year Southern Railway had recognized the importance and necessity of better accommodations for the people of Kernersville. So Dr. Sapp sent a thank you to the Winston-Salem Journal on March 27, 1902 to thank Southern Railway for the desirable, spacious, and up-to-date passenger depot for our comfort and convenience. Then came the Kernersville Merchants in 1968 that eventually turned into the Kernersville Chamber of Commerce and on April 21, 1986 was identified as a 501 c 6. In 1970, the Bicentennial Committee urged all citizens to become interested and begin to participate in the events planned for the Centennial starting March 27 and ending April 2. The events of the Bicentennial included a vintage parade, walk to church, lantern service, Tour of Industry, Tour of Houses, Time Capsule Ceremony, Vintage Fashion Show and Victorian Bargain Days. In 1971, the Chamber received a letter from President Richard Nixon recognizing Kernersville’s 200th Anniversary. Our Chamber has a rich history, just like our wonderful community. Will you join us in celebrating?